2012 will see the rapid entrance of the low-cost model in Japan, a market whose high focus on service had been used as an excuse for why a la carte LCCs could not gain a standing in the country. The country's first LCC to come to market, Peach Aviation, has released its launch fare structure that offer discounts upwards of 58%. Despite fares significantly lower from full-service competitors, its ancillary options are so far basic, leaving room for improvement from established LCC brands AirAsia and Jetstar, who will enter the market in 2012 with their AirAsia Japan and Jetstar Japan subsidiaries. While Peach's offerings may be underwhelming for those versed in LCC commercial strategy, they will still come as a shock to the Japanese, who have broadly not experienced a home-grown LCC. While Peach will have the first mover advantage in the market, it will also be the first to help the market adjust to LCC pricing strategies, which AirAsia and Jetstar will build on. Peach too can also be expected to expand its offering. It should be noted Peach and Japan's other forthcoming LCCs do not need to use ancillary fees to entirely make up the gap in fares with Japan's incumbent carriers. All Nippon Airways (ANA) and Japan Airlines (JAL) especially are highly inefficient carriers with large cost bases. There is redundancy in booking systems, high employee aircraft ratios and low aircraft utilisation. Relatively new carrier Starflyer operates A320s with only 144 economy seats on domestic flights. Peach will use the standard LCC configuration of 180 seats on its A320s, and to further promote its LCC model Peach even mentioned to the public on Facebook how employees "take turns taking out garbage everyday in our office. It is as part of our policies to control cost, and build a cost-conscious culture". Peach this week opened reservations on its inaugural flights from its Osaka Kansai base to Fukuoka and Sapporo beginning in Mar-2012. Peach's fares start at JPY3780 (USD48.75) to Fukuoka, 244nm away, and JPY4780 (USD61.65) to Sapporo, 585nm away. These are introductory fares and not headline fares only available for a few hours. Even once the mandatory payment fee is included, passengers travelling only with hand luggage can save up to 58% compared to offerings from ANA and JAL. Those with checked luggage will still see savings upwards of 47%, affirming LCCs will usher in a new era in Japanese and North Asian aviation. Further competition can be expected once AirAsia Japan and Jetstar Japan launch operations later in 2012, AirAsia Japan in August and Jetstar by December. Peach has separately announced it will hold a web-only fare sale in the future with seats from Osaka being offered at JPY250 (USD3.22). Approximately 10% of all seats will be offered at this level, according to Nikkei. Peach is promoting this sale as two tickets being equivalent to the price of one piece of its namesake fruit. (The airline efficiently clarifies this statement to say that price assumption "is based on the actual retail price of a 'Hakuho' peach sold at 'JA Kinosato farmers market merremon hiroba'".) The marketing effort to promote the fare based on an equivalent product helps Peach promote its low fares without flaunting the price amount. Cheapness in Japan is associated with an inferior product, and for aviation is associated with a less safe airline. Note: Flights include services from all of a city's airports. Peach and JAL fares based on sample March availability. ANA fares based on sample February availability, the latest dates its booking engine supports at time of writing. The country's regulator, the Japanese Civil Aviation Bureau, requires airlines to file all fares with it before they go on sale, potentially slowing down the ability of a LCC to quickly respond to market dynamics. However, a work around solution is to file in advance every possible fare so a range of fares are at an airline's disposal. Quick responses will be imperative as competition increases with the entrance of AirAsia Japan and Jetstar Japan. The most notable feature is Peach's offering of a simple two-tiered fare structure. AirAsia and Jetstar offer one level, although Jetstar's fares can be added to with "bundles" that include date flexibility as well as frequent flyer point earning on parent company Qantas. ANA and JAL, however, can offer upwards of 18 different fares for a single flight. Peach's "Happy Peach" fare includes only the basic seat while the "Happy Peach Plus" fare includes checked luggage, selection of basic seat, no fees to change flights and reduced cancellation fees. Fares and fees are higher when purchased through a call centre or airport counter. The basic fare can only be booked until two days prior to departure while the plus fare can be booked right up until departure. On the Osaka-Fukuoka route, the plus fare is JPY1700 (USD21.87) more than the base fare. The checked luggage and seat selection are valued at JPY1260, leaving JPY440 for the advantage of changing flights without fees or cancelling tickets without foregoing the entire ticket. The plus fare will be appealing to business travelers given its flexibility, but Peach will not initially target the business sector given its typical reduced frequency on routes compared to incumbent legacy carriers. Despite Peach's website launch and emphasis on ticket sales there (such as with the web-only sale), Peach expects to sell less than half of its tickets through its website, lower than established LCCs but higher than at ANA and JAL, where web sales account for less than 20% of tickets. Credit card proliferation is low in Japan and far more popular are stored value cards. The cards can be used at a variety of stores and some individuals in Japan even have card readers at home so they can top-up their account whenever they wish. Payments through stored value cards are popularly made at convenience stores, and Peach plans to eventually support that distribution. That will also give assurance to passengers by booking with a new company through a trusted payment system. Peach will also work with global distribution systems, which the Chinese market relies on (Peach will expand its services to international points). The carrier will also work with travel agencies that book huge numbers of corporate and school trips. Reliance on traditional GDS methods helps justify the two-tier product. Traditional distribution systems are largely incompatible with add-ons. Having a separate fare bucket that incorporates checked luggage and seat reservation overcomes that distribution hurdle. 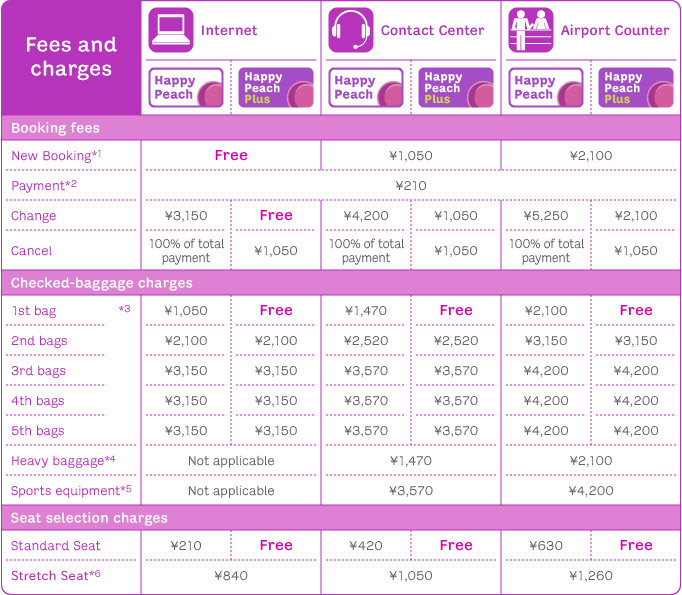 Through 16-Jan-2012 a credit card fee of JPY210 (USD2.70) per passenger per one-way flight is waived. AirAsia and Jetstar in their home markets charge more, Jetstar especially (see table). The two have not revealed their pricing for the Japanese market. Peach provides 10kg of carry-on luggage but checked luggage is charged a flat JPY1050 (USD13.52) per piece upwards of 20kg. AirAsia and Jetstar in their home markets price luggage based on weight with AirAsia offering luggage in 15kg, 20kg, 25kg and 30kg options, with its 30kg price only slightly more than Peach's flat 20kg price. Jetstar offers the same luggage weights but also in 35kg and 40kg options, and all priced significantly higher. For a cross-continent comparison, Peach's luggage allowance and pricing is equivalent to easyJet. Jetstar's Australian prices are more representative than AirAsia owing to different economic purchasing power in each country. Although the Japanese market is accustomed to free advance seat reservation on flights, Peach will charge JPY210 (USD2.70). Reservation of extra legroom seats, of which there are 18 on Peach's A320 (two exit rows and the front bulkhead), are available forJPY840 (USD10.82), approximately the same on an AirAsia flight of equivalent length but nearly a third the cost of an equivalent Jetstar flight. Peach's booking process is short and straightforward. In comparison, AirAsia, the leader in ancillary options, gives the option to select from 16 meals, amenity kits, priority check-in package, ground transportation and insurance. AirAsia automatically selects the insurance option while Jetstar automatically selects seat reservation, both adding fees to passengers who do not carefully scrutinise their booking. Jetstar also gives the option to book hotels and cars during the booking process. Peach supports hotel bookings, but this functionality is not integrated in the booking process. There may also be limited applications for these ancillary options: cars are unlikely to be necessary for those staying in Japan's urban areas with superb public transport while hotels are often booked last minute. To further ancillary sales, AirAsia and Jetstar allow ancillary purchases to be made after booking – and AirAsia is aggressive in sending e-mails post-booking encouraging further sales. But Peach does not yet support post-booking purchases on its website, instead sending passengers to its call centre. Unlike the 24/7 call centres kept by AirAsia and Jetstar, Peach's call centre, at least in its launch phase, is only open Monday through Friday from 9:00 to 18:00. Peach has not yet released its in-flight product and sales opportunities, an area where AirAsia and Jetstar are aggressive in. Full-service competitors ANA and JAL offer a limited range of complimentary drinks but charge for in-flight snacks. Starflyer offers a differentiating point of also serving complimentary snacks. Whereas Starflyer's seats are plush with molded headrests, Peach will offer basic seats, reducing costs, although using two seat cover colours (purple and black). 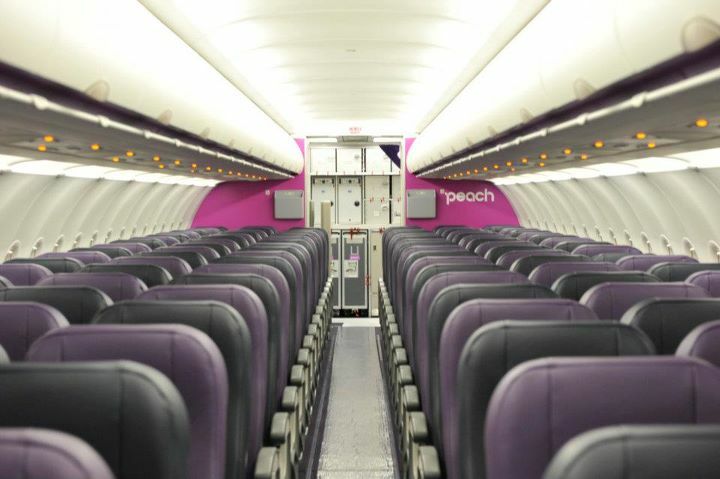 As the Japanese market adjusts to the LCC model and Peach looks to shore up its ancillary options compared to AirAsia and Jetstar's far more mature and diverse options, Peach could be expected to introduce new charges and ancillary revenue options.